Summer is here, and the water cooler is buzzing with vacation stories. Relive your favorite destinations with flowers and plants. Harvard research shows having flowers in the home is good for emotional health, and Texas A&M research demonstrates flowers and plants make us work smarter. Here, I’ll share with you how flowers remind two good friends of their travels and creative ways to use flowers for your own getaway. For spring break, my friend and her husband had a delightful holiday golfing in Phoenix. After returning home, my friend wanted to send her husband a surprise gift at work. She told her florist about the trip, and the florist custom designed the perfect floral arrangement. It had sand at the bottom of a clear vase, a layer of colored golf tees, a layer of colored golf balls, a layer of ‘Green Trick’ dianthus as turf and a ball of white carnations on top. When my friend saw it, she liked it so much she called the florist and sent one to herself. Another friend and her husband are obsessed with Frank Lloyd Wright and spent a vacation visiting anything and everything having to do with the architect. 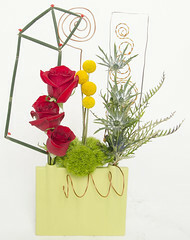 Their florist had the perfect container with three openings and designed an arrangement that speaks to the fascination. The vase’s three openings hold flowers as well as interesting architectural embellishments. My friend displays it proudly at home, and refreshes it weekly with new flowers. Ready to get away? Treat yourself to flowers. Here are three ideas perfect for your desk at work. Flowers can take us to places of tranquility. 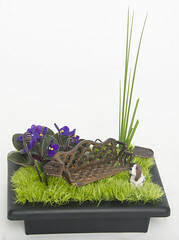 This little bench reminds me of a garden, calm and serene. 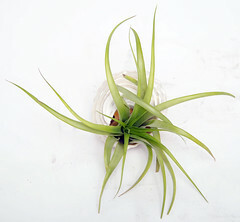 For those longing for ocean breezes, place a tillandsia in a seashell on your desk. Here is a sweet idea: This little hanging container is meant for a votive candle. Instead add water and a fragrant flower. It will take you to the tropics. The journey is as precious as the destination. Ask your florist to create a custom floral arrangement designed with your vacation in mind. Tell me about the flowers and plants that remind you of your favorite vacation spots.